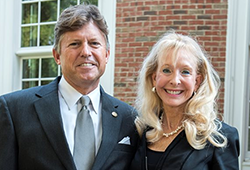 Elon alumnus and Trustee John R. Hill '76 and his wife, Lesley, of Severna Park, Maryland, continue their generous support of the university with two major gifts. One of the gifts from John and Lesley Hill is an estate gift that will bring significant funding to the university in the future. The other is a $100,000 commitment to support construction of Richard W. Sankey Hall, the new three-story, 30,000-square-foot facility that will provide much-needed space for the growing Martha and Spencer Love School of Business. Hill earned his Elon degree in economics and business and is committed to helping the Love School achieve even higher levels of national recognition. "I have spent my entire career in the business world, and I enjoyed my business major at Elon, and that set the foundation for me to move forward," Hill said. "Students will be in a wonderful new facility and be able to learn in a state-of-the-art fashion. I think the closer they can get to a real-world experience, the better they're going to do when they graduate and are out in the business world." President Leo M. Lambert thanked John and Lesley Hill for their generous and loyal support of the university. He also praised John for his efforts in helping to build a vibrant alumni network, one of the key goals of The Elon Commitment strategic plan. "John's leadership as a trustee and an alumnus has been essential to building a network of committed alumni that will continue to drive Elon forward long into the future," Lambert said. "Elon is a stronger university because of dedicated alumni and friends like John and Lesley Hill." John Hill has been actively involved with his alma mater, serving previously as president of the Elon Alumni Board and currently as a member of the Board of Trustees since 2013. He and his wife established the John R. Hill '76 and Lesley W. Hill Endowed Fund for Engaged Learning in Business to support research or other on-campus study, international study or business-related internships. They have also made generous gifts to support scholarships, the Inman Admissions Welcome Center and the Phoenix Club, and are members of Order of the Oak, Elon's planned giving society following their estate gift. The first-floor conference room in the Inman Admissions Welcome Center is named in honor of the Hill family. Hill said he and his wife chose to put Elon in their estate plan because they wanted to make an even bigger impact at the university in the future. "Giving back is important to us, and we are hugely blessed to be in this position," Hill said. "Estate gifts are a powerful way to make a significant impact in the future. It's the easiest gift one can ever make, and it can be substantially larger and more meaningful over time when it comes to fruition." Hill serves as chief executive officer of Pinnacle Advisory Group, a leading privately held wealth management firm that he founded with two friends in 1993. He also leads Pinnacle Advisor Solutions, a sister company that establishes independent strategic partnerships with small wealth management firms around the country. In addition to his service to Elon, Hill has been involved with many charitable boards and organizations in his community, including Optimist, the Jaycees, Sheltered Workshop, the American Heart Association and Habitat for Humanity. He has also served as chair of the finance committee at the Maryland School for the Blind. Equally dedicated to his profession, Hill has served as both a board member and a two-term president of the Financial Planning Association of Maryland. Hill received Elon's Distinguished Alumnus of the Year award at Homecoming in October in recognition of his dedication to the university and his professional achievements. After accepting the award, he reflected on the progress at Elon since he was a student. "When I look back over 40 years, the pride that I have for Elon, watching that growth and watching things happen, is just an amazing and exciting experience."